Considering Zoya designed this polish to dry matte and be used with a topcoat, it would make sense to add that info to the description. A swatch pic would also help. 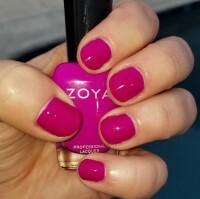 Zoya Nail Polish | CharismaFabulous Color! 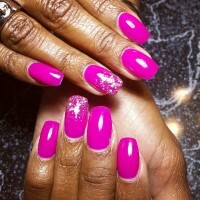 Charisma is a fiercely fabulous color, you will not be able to stop looking at your mani/pedi. but, as with all matte polishes, she chips very easily. I knew this when I bought it and I was hesitant to purchase a color that I knew would chip easily, but I`m glad I did it. A normal Zoya manicure will last me 7 days, Charisma only last 4 days or so, but the color is mesmerizing for those four days! I am pretty sure I burned my retinas when I took this stuff out of the box, it is much brighter that it looked online, and I am glad!! Awesome color, everyone at work wants it too now. When I got this color, it was definitely more pink toned than the picture on screen. It`s hard to judge color on the computer, but I still like how it came out. I`d say it`s a neon magenta, but more sophisticated, stylish neon and less highlighter neon. Covers completely in 2 coats, but definitely needs the top coat. Zoya Nail Polish | CharismaNot for a wallflower! 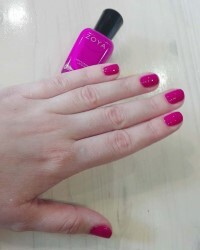 This is the first Zoya review I`ve written. While I love all of my little Z`s, I`ve never opened a box of nail polish and literally gasped at how beautiful a color is. That is, until now. 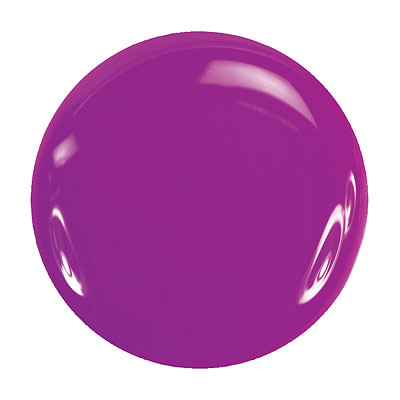 Charisma is a striking, bright purple with a bold fuchsia base. Oh, there are no words to describe how beautiful it is. One must be a lover of all shades purple to fully appreciate this polish. Wow! One thing that surprised me is that it dries matte. I don`t consider this a problem, as I always use Seche Vite as a top coat, which adds a great shine to my finished manicure. However, this means a top coat is required for those who don`t prefer the matte look. This isn`t a quick, run-out-the-door-in-a-single-coat polish, although full opacity can be achieved in a single coat if applied carefully. Such a strong color requires precision in application. Just wanted to share my excitement for this brilliant find. The Zoya Fairies are always hard a work, coming up with new and interesting colors for those of us who prefer our talons polished. Although Charisma is not a new color it`s new to me, and it is truly a gem! Fabulous color, dries matte but will be glossy with Zoya top coat. 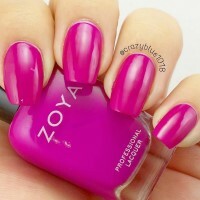 Zoya Nail Polish | Charismalove it! This is my favorite color for my toes. My skin is latte colored and I have a teal yoga mat, the color of my toes pop in yoga class! 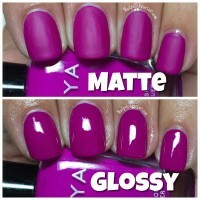 You do need to wear a clear top coat to bring out the color otherwise it`s a dull matte. I love the color but don`t like that it is matte. It doesn`t wear well but I still use it & get lots of compliments. Really like the color, however it dries matte. I wish it was glossier but I still really like the color. It`s bold and trendy. Recommended, but not highly. Gorgeous color- neon, berry-toned purple. However, because it dries matte, she chips easily (mine chipped within a day, the fastest of all my Zoyas); I understand that neons dry matte and therefore are prone to chipping. Oh well. The color is unique: Super bright but also vampy! As much as I loved it, it chipped and scratched within a day and that was with topcoat. I own many polishes and this is unusual for me. 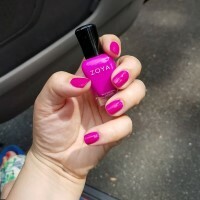 Zoya Nail Polish | CharismaAwesome shade! The color in the bottle seemed intense and quite unlike anything else I`ve seen. So taking the chance, I tried it. I highly recommend this color. Try it...you won`t be sorry! 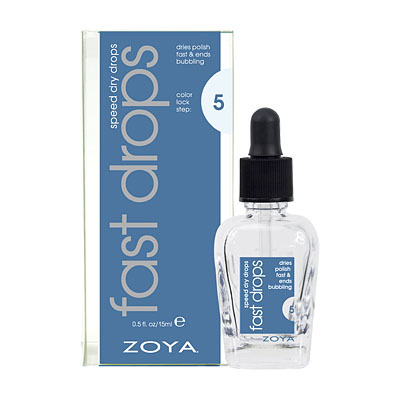 Zoya Nail Polish | CharismaRESEARCH before you buy AND review! This color is so gorgeous, it is a shame some people left bad reviews....and why? Because they did not read that it had a matte finish or maybe understand what a matte finish is. I personally do not like matte finishes (that is the dry, dull look), I love glossy. If you do not know what something is, do not blame the company or the color...look it up:) I just put a top coat over this and have no problem with wear and tear. 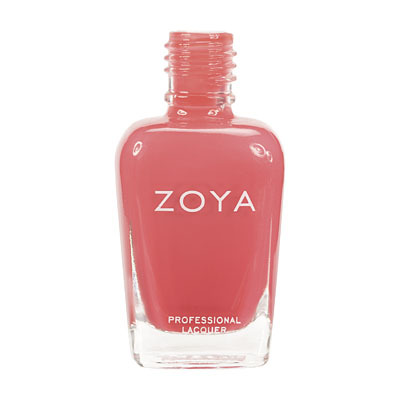 Mattes do tend to chip easier...Zoya IS a durable nail polish brand...this is with ANY brand`s mattes...they (mattes) are a delicate polish and will chip and come off much easier than a regular glossy polish. 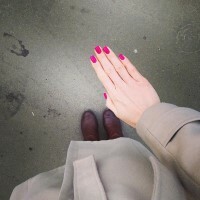 My suggestion is to ALWAYS wear a top coat over this if you want to wear this color out! Great job Zoya on another beautiful color! I have been using Charisma on clients pedicures for over 3 years. It continues to be popular with my regulars so I just wanted to let everyone know that Charisma was never intended to be worn as a matte shade. I had this problem because my clients were buying Charisma to use at home, but alot of them didnt take the time to use a topcoat between visits. 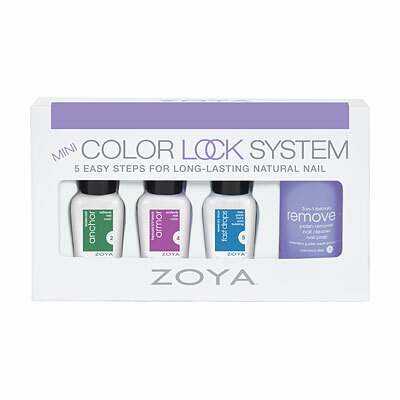 It made me pull my hair out at first, then I talked with the distributor for Zoya in CA. They told me it should always be worn with a topcoat for lustrous finish. The pigment is unique in this shade and requires topcoat at all times for finish and wear. The best color but to bad it chips. The only Zoya polish that seems to do this. Also the only one that seems to dry matte so that might have something to do with it. I totally missed the memo about this being matte. I love the matte finish, and I really love how fast it dries, but I`m a writer, and I spend my days turning pages in books. This stuff slides right off if it brushes against a page. It`s really a pretty color, and it looks great, but it`s not very wearable. 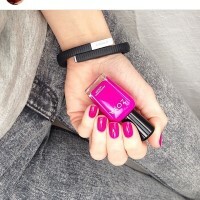 Zoya Nail Polish | CharismaLove! This is my new favorite color. At first I really disliked the matte finish, but after 3 coats it was completely opaque and the next morning I actually loved the matte. My husband thinks it`s really cool looking and requests I wear it! The color changes depending on the lighting - its a deep dark plum in low light and very intense magenta in bright light. One application lasts almost 2 weeks without chipping for me! Love! 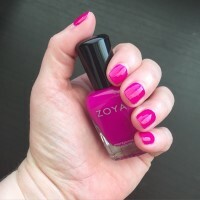 Zoya Nail Polish | CharismaBeautiful! (but chips UBER EASY : .(.. 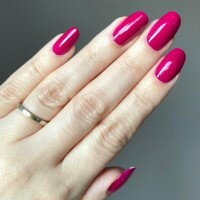 I looooooove this color, it`s soooo original. So different. and Definitely interesting. It`s so distracting, I just sit and stare at it all day trying to figure out why it looks so cool. ONLY THING IS!! you MUST put clear on top b/c it dries...weird, it`s like this dull mud looking finish to it, it was weird the first time I put it on, but whenver I put clear right on top, you would never know the difference. OH ALSO! ...it chips Real easy. Like. the next day easy. Like, since it`s a pretty good color, I only needed one coat, then the next day it was chipped. So I put on a second coat... and IT CHIPPED AGAIN. that is weird, and i`m not rough on my nails at all. So. : ( it`s kinda sad cuz i love the color so much, but it doesn`t want to stay on my nails!! : .(.. Chipped after 2 days. Very disappointed. I even reapplied it and it chipped again. Um, 2 weeks, NOT! 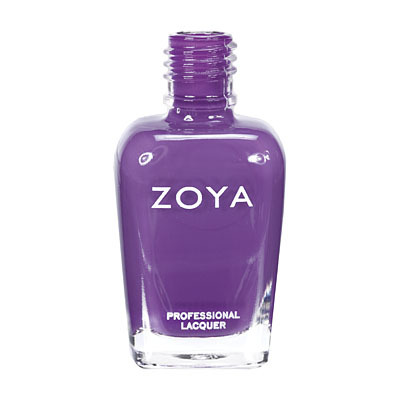 Zoya Nail Polish | Charismabeautiful! I really love this color. It goes on very smooth and evenly, and was opaque in two coats. It does have more of a red undertone which you don`t really see if the picture (at least on my monitor). Also, dries a little on the matte side but my Armor topcoat had it looking very shiny.